This is the chart for Revelations that I mentioned. It is by far, the most accurate I have ever seen. There is a lot you can glean just by studying the chart. Underneath the chart, I have given brief explanation of what is represented on the chart and put things in chronological order as much as possible. This chart is a keeper, also easy to share with others, like the Rapture chart. AS YOU KNOW, people would much rather look at a picture than to have to read. The red is reused for Gospel outreach, but when looking at seals, trumpets or bowls, the color helps you keep it where it belongs, and green is used for safety only. Jewish Agenda: God made a covenant with Abraham and it is binding for eternity. No matter what agenda God appears to be dealing with, the Jewish people are always a central part of that agenda. Of course at the heart of the AGENDA is to get as many Jewish people to accept Jehovah/Jesus as their God and to have eternal life. 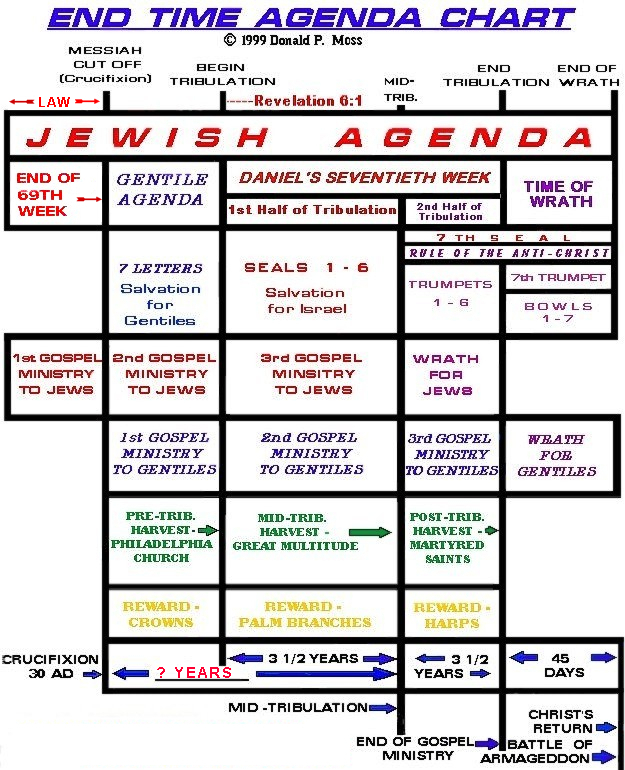 End of 69 th Week: from book of Daniel, 69 th week Jesus (Messiah) is crucified and new agenda is added to the Jewish agenda. This marks the beginning of the Church Age for the Gentiles. Gentile Agenda: God made a covenant with Jesus and it is binding for eternity. Those who accept Jesus as their Lord and Savior can get it on that covenant as well as eternal life. This is where we have been for the last 2000 years. The church, or followers of Jesus have spread across the globe, pointing to the same God as the Jewish people. Of course at the heart of the AGENDA is to get as many people to accept Jehovah/Jesus as their God and to have eternal life. 7 Letters (Revelations 1-3) Salvation for Gentiles: Messages to the churches, from Jesus to the Tribulation, whose job has been to spread the Gospel to the world. Pre-Trib Harvest Rapture = Promise to Philadelphia Church, also knows as Barley Harvest. Seals 1-6 Salvation for Israel: (Revelation 6:1 begins seals, 4 horses of apocalypse) During this time, God's agenda is to focus on salvation of Israel. The Gentile nations will begin to really feel the stress of a world in chaos. Thus far, the distress comes from the 4 horses of apocalypse which bring kingdom of Antichrist, war and complete civil unrest across the globe, money woes, hyper-inflation, starvation, disease, much death from all of the above. But those events caused by God, known as wrath have not yet begun. Mid-Tribulation Harvest Rapture = Promise not appointed to wrath, Great Multitude also known and Wheat Harvest. No one who accepts Jesus before the 1st Trumpet will stay on earth during wrath. Jews from Israel escape from Israel to safety at this time, until Jesus returns for them. Mr. Moss leaves them out. Now the disasters from God come on top of the misery that is already being felt around the world. Post-Tribulation Harvest = Mr. Moss has martyred saints, but if they're dead, they are already with the Lord. It is the Olive Harvest at this point. This is the Two Prophet Witnesses who are resurrected in front of the world, and the 144,000 Jewish Evangelists. I need to say at this point, I just don't know yet if the 144,000 and the Two Prophet Witnesses actually leave before the 6 Trumpet Judgments or just before the 7th Trumpet. My thought is that the 144,000 leave after the believing Jews escape Israel to safety before the Trumpets, but the Two Prophet Witnesses give Antichrist a tough time in Jerusalem during the 6 Trumpet Judgments when he is doing his best to overpower Jerusalem for himself. Who else would they need supernatural power against if not the Antichrist/Abyss Beast? 7th Trumpet = releases the 7 Bowl Judgments after these, the world as we know it is unrecognizable. Jesus Returns with His armies which are the raptured and resurrected saints along with all His angels. We face the remaining armies of Antichrist and the world. War of Armageddon = The war that ends all war for 1000 years. One more thing, ignore the yellow rewards section on the chart. They aren't rewards, but identifiers among the raptured/ resurrected groups.